Good morning y'all, we're down to our Top Three on Top Chef for season 15, do you have a favourite? I think I know who has this, and I know who I would LIKE to win it but I'm pretty sure they aren't the same person, so let's roll the semifinals! 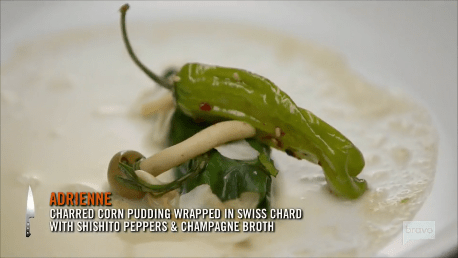 Last time we had family members bring their classic dishes and the four cheftestants recreated them lovingly while elevating the food into host Padma Lakshmi's favourite meal of the season. Even with all that excellent food, we had to lose someone and we lost Colorado chef Carrie Baird for the wont of some braising sauce on her ravioli (not a euphemism). Remaining chefs Adrienne Cheatham, Joseph Flamm and Joe Sasto III are heading to the Aspen Food and Wine Classic and we hadda have two Joes in the semis? Really? They're staying at the Viceroy, sooo fancy pants! Champers for all! Awwww, Joseph calls his wife Hillary, they're so adorable. He's very down to earth and she seems like a great match for our TeddyTestant. Hey, I wonder how chef Bruce Kalman is doing with his new bebeh? 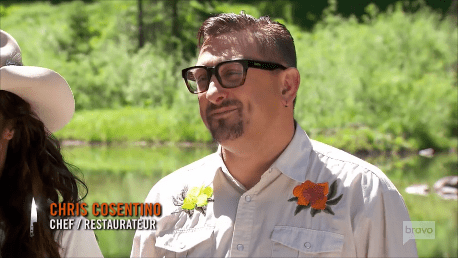 Padma welcomes everyone to the next Quickfire Challenge, guest judge Chris Cosentino (won Top Chef Masters) will be joining us at the T-Lazy 7 Ranch. There's a lake right there, could that have something to do with the challenge? It sure does! I caught on as soon as Padma said they have 40 minutes instead of the usual 30, they get that extra 10 minutes to catch a trout. I'm positive I couldn't catch a trout in all 40 minutes. Good thing there's canned food in case they don't catch something! And he gets it! Just like when he was fishing with his dad in Florida when he was a kid! Sasto III gets the next fish, poor Adrienne is gonna end up with tuna casserole. Ohhhh nooo, Sasto III hasn't ever filleted a fish before, I worried. Adrienne nabs a fish with 22 minutes to go! Go A-Sizzle! Crispy Skin Fish Something but not much of it. Ohhh nooo, apparently fish this fresh usually can be served almost raw, but not when it's in a mountain stream. It has to be cooked all the way through because bears poop uphill and I don't know if that was a metaphor but Chris won't let Padma eat Adrienne's dish. Sasto III overcooked his, so he's excited! And wins the challenge AND an advantage in the Elimination Challenge. Each cheftestant will be preparing a vegetarian meal for 200 at a Food and Wine event. AND they're be cooking over cauldrons, yiiiikes. Hey! I just asked about Bruce and there he is! He and Carrie Baird are back with my fave chef Chris Scott, they're going to be helping on this event! Joseph gets to pick first, he chooses Carrie, then Chris for Joe and Bruce for Adrienne. Sasto III is struggling to come up with a vegetarian dish, he's all over the place. Chris nods encouragingly while Bruce never stops suggesting stuff at Adrienne. She's had trouble in the past taking the lead, you tell him what you think, A-Sizzle! He's helping YOU! I want Joe's roasted baby squashes. Sasto III is making Beet Yogurt...? Not only does Carrie know how to cook over a cowboy cauldron, her dad used to make his OWN. Everyone heads back to the hotel after Whole Foods...where did the three sous chefs go? Why wouldn't they eat together? That's weird. It's the next day and Joseph is just so bloody positive, you know? So positive, he's awesome. Holy shite these cowboy cauldrons are massive; they can fit 10 dutch ovens, but swinging. An deer wanders by and nobody breaks stride. 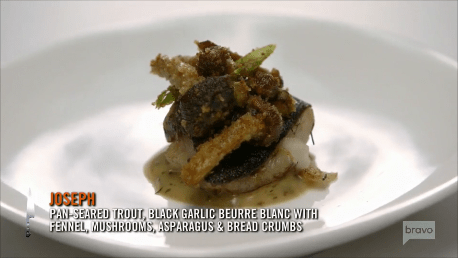 Adrienne has a super complicated meal planned, go for it, Adrienne! Food & Wine editor Nilou Motamed and head judge Tom Colicchio stop by for a temperature check, Adrienne explains her dish then says "you gotta let your balls hang out at some point" and I think Tom blushed! Nilou was DOWN. Tom keeps talking and talking, she has a lot to do, TOM! Next they stop by Sasto III's tent, I didn't know that he'd never been a head chef working his own menu before, that's surprising. He's very accomplished. A quick stop by Joseph and we're almost out of time! Adrienne is having a LOT of trouble with her dish and I am afeared we're gonna have another JoeDown. Time to roll! Brooke Williamson is there! So are the Voltaggio brothers, Gregory Gourdet, Jonathan Waxman, Ludo Lefebvre, Danny Meyer, Daniel Boulud and so many other non-chef wealthy foodies. The head and guest judges nosh and reminisce, this Daniel Boulud is a big deal! 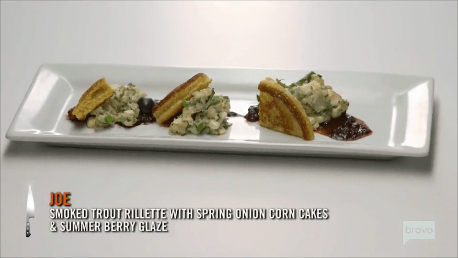 The judges think the snozzberries taste like snozzberries! But really, super beet-y and Brooke DIGS that. It tastes ever MORE like dirt? But his bread was boring, needing "nourishment." 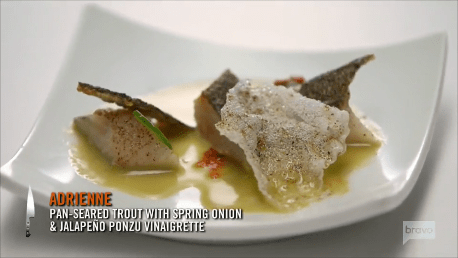 Called a 'smart dish' and 'texturally interesting' even though Jonathan Waxman thinks Bruce must be the chef because: dude. On to Joseph from Chicago! 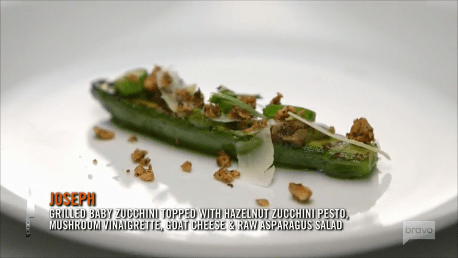 Rich goat-cheesy, but the baby zucchini was bland. It was the first dish to taste like smoke, so fingers crossed! If I was guessing, I would say Adrienne and Joseph Flamm would be the winners. Let's see what the judges think! They loved Adrienne's dish, ballsy but needed a bit more char. Joe Sasto III doesn't get great feedback, they thought it lacked cohesion. He hangs in there all right until they start to compliment Joseph Flamm and his head drops. I fear Adrienne's feedback was overly kind to her face maybe. Joseph Flamm is called first and we all stop breathing: he's moving on!! Then we all laugh when he starts breathing and says "That was mean!" because it WAS! Now who's going home... Joe Sasto III. Holee shite. I thought he had this for SURE. Wow. It's odd that he thinks he was a young underdog, he had the skills and creativity all the way through, I grudgingly thought he was a shoe-in. 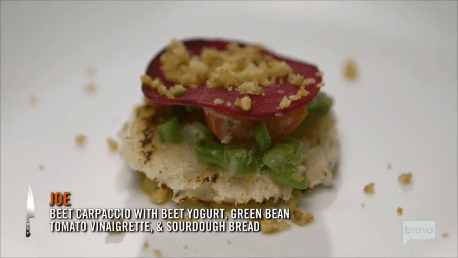 Well, Top Chef Top Chef isn't too shabby, Sasto, good luck to you. Yay Adrienne and Joseph!! I can't wait for the finale now!